In the field of traditional electric chain hoist, R & D engineers only focus on the capacity of handling & lifting materials in early years. Machine replaces manpower. However, it not only overlooks the appearance, dimension and lifting height, but also disregards the IP protection in wretched environment. Therefore, Cheng Day R & D engineering team, based on demand and application of market, put a great deal of time effort into designing electric chain hoist for European market. – It minimizes the distance between hooks. Hoists can apply individually, or apply with motorized trolley, geared trolley and plain trolley functionally. The advantage feature: mechanism load meets FEM 2m, motor pole 4 : 1, the difference between high and low speed is significant, meets different load requirement, low voltage control 48V for operator safety. The sustainable efforts and hard works of Cheng Day Machinery Works Co., Ltd. meet market inquire. The aims of Cheng Day Machinery Works Co., Ltd are thinking and developing values for customers, prompt reply and continuously efforts to meet customers’ satisfaction. 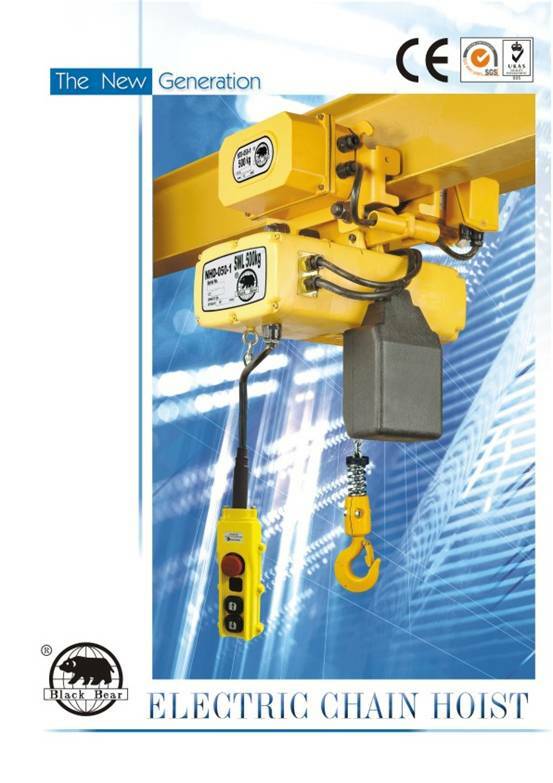 Facing to the high demand of handling and lifting equipment, we contribute to the development and research of electric chain hoist. Currently we have completed model NHD series product, the load capacity is from 250kg to 2000kg to meet market demand.